Matt Bird Investment Blog: UK Residential House Prices - Blowing Another Bubble? UK Residential House Prices - Blowing Another Bubble? The business secretary Vince Cable warned that the government's Help to Buy scheme may trigger a new house price bubble when he appeared on the Andrew Marr show last Sunday. The man may have a point. It is easy to understand why the government are meddling: they're trying to provide liquidity to a mortgage market that is being choked off while lenders struggle with new capitalization targets. Their attempts to stimulate the demand side are typical of an incumbent government trying to curry favour with voters. Rising house prices can inject a feel good factor into the economy. Homeowners feel wealthier and are more likely to spend, hopefully boosting GDP numbers along the way, thus enabling George Osborne to set his face to extremely smug. Hopefully Mr Osborne won't have forgotten that it was an unbridled housing market that helped get us into this mess in the first place. Whilst some amount of government intervention might be productive, the last thing we need is for house prices to start increasing at rates above wage inflation. The graph below shows how house prices have fallen in relation to earnings in the years following the financial crisis. 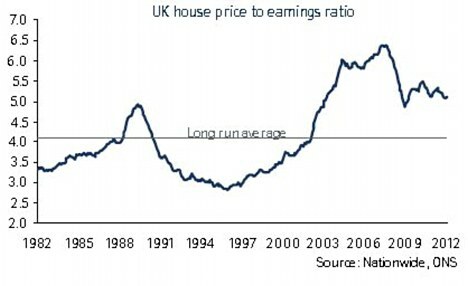 This pullback has been healthy; ideally we need this graph to fall further until house prices reach their long run average of 4X earnings. This would set the economy in good stead for interest rate normalization. Arguably the government should be doing more to help increase housing supply, thus easing the chronic housing shortage that we have in the UK, whilst putting more downward pressure on prices relative to earnings. I think the ideal scenario is probably for house prices to remain constant nominally but continue to fall in real terms against wages and inflation. As an aside I found an interesting graph on www.housepricecrash.co.uk showing the life cycle of a bubble (see below). What stage do you think our housing market is at now? I think maybe we are at the Return to ''normal'' stage, with interest rate normalization eventually pushing us into the fear and capitulation stages. Just a guess. Hi there, I'm Matthew Bird. I'm a UK based Investment enthusiast. Follow me on twitter @mattbird55. WARNING: THE INVESTMENTS MENTIONED IN THIS BLOG ARE HIGH RISK. YOU MAY LOSE MONEY IF YOU TRY TO EMULATE THEM, AND WITH CERTAIN TRADING METHODS (SUCH AS SPREAD BET/CFD) YOU COULD LOSE MORE THAN YOUR INITIAL INVESTMENT. The past performance of any investment/product mentioned is not a reliable indicator of future results. Also any individual stocks mentioned are likely to be owned/traded by myself. Views and opinions are my own, and do not constitute professional financial advice. I will not accept any responsibility for money lost as a result of copying my actions. Whilst considerable care has been taken to ensure the information contained within the commentaries and articles is accurate and up-to-date, no warranty is given as to the accuracy or completeness of any information and no liability is accepted for any errors or omissions in such information or any action taken on the basis of this information. The opinions expressed are made in good faith, but are subject to change without notice. Advertisements on this site are not endorsed by me in any way.